I was given this by PR a few months ago and from first use, I wanted to jump on here and exclaim my love for it… but I didn’t. I’ve spent good money on glass nail files before, fallen in love with them and then watched them become ineffective after a month or so. 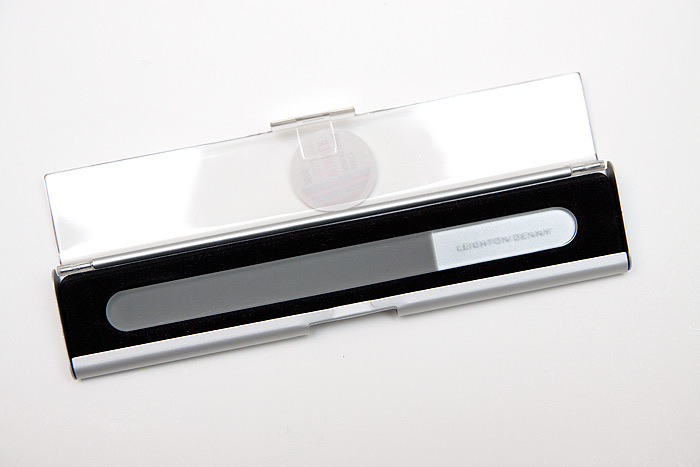 Leighton Denny’s Crystal Nail File is different. It’s made from lead crystal that’s been treated to create a filing surface that is literally guaranteed to last a lifetime (the guarantee is in the box!). This is the 135mm ‘model’ that comes in an aluminium case and I really recommend getting one that comes protected like this. Whilst the filing surface should last indefinitely, they’re still delicate tools and prone to breakage if dropped or carried around in handbags. I developed a horizontal split in my thumbnail after dropping something very heavy on it a month ago… it reaches very nearly halfway across the nail bed and I’ve been nursing it in the hope that I can keep the nail intact until it grows out. With a fragile nail like this, I didn’t think I would be able to go near it with a nail file… but I was wrong. The Leighton Denny Crystal Nail File is so gentle that I can carry on like nothing has happened. The file glides, it never catches… it turns the nail to dust right before my eyes and I’d liken it to a hot knife slicing through butter. It’s like kryptonite to the ragged edges of my nails. At £12, it’s one of those purchases that you wouldn’t appreciate until you started using it. I wouldn’t be without mine and when Leila got hold of it a couple of days ago, I panicked… turning into a jump negotiator as she waved the crystal wand around in her chubby little hands (perilously close to the table edge). 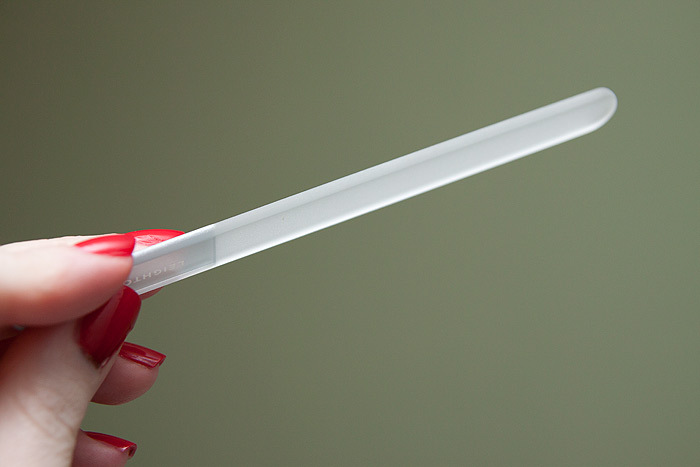 I’m completely in love with this Crystal Nail File and would happily rate it as a beauty must-have. What do you use to file your nails? As a producer of glass nail files, I totally agree with you about features you describe. The only confusing thing is price.